Visiting a presidential museum is like taking a trip back in time; as these massive exhibitions not only focus on the one-time president, but also the era in which he held office. The Woodrow Wilson Presidential Museum (540-885-0897, www.woodrowwilson.org), located in Staunton, Virginia, is no exception; and it’s a great place to learn a little bit about World War I, as well as President Wilson. Although there is wheelchair-access to the museum, it’s a bit tricky to find if you don’t know where to go. First and foremost, do not follow the signs to the museum parking lot and the admission office, as you need to be able to climb up and down steps to navigate the route. That said, there is an alternative accessible parking area located off of Coalter Street, near the Smith Administration Building. Since the admission office is only accessible by steps, folks with access issues can simply buy their admission tickets inside the Smith Administration Building. And if the accessible parking by the Smith Administration Building area is full, there are additional spaces behind the museum. There’s a barrier-free pathway from the parking area to the museum, with level access to the front entrance. Loaner wheelchairs are also available on a first-come basis. Inside the museum, you’ll learn all about Woodrow Wilson, the Princeton educated son of a Presbyterian minister who would become the 28th President of the United States. Because of a divided Republican Party, Wilson had an easy victory in 1912; however the 1916 election proved more of a challenge. War was raging in Europe and Wilson ran as the candidate of peace and prosperity, with the slogan “Help keep us out of the war.” After a narrow victory he took office, but was later compelled to enter World War I when the Germans escalated their attacks. There’s certainly no shortage of WWI exhibits in the museum, including a replica of a WWI trench. Although there’s level access in the exhibit, you have to be able to walk down a flight of stairs to access it. Alternatively, a video of the exhibit is available upstairs. Other museum highlights include old convention tickets, campaign buttons and even some of the 18 books authored by Wilson. 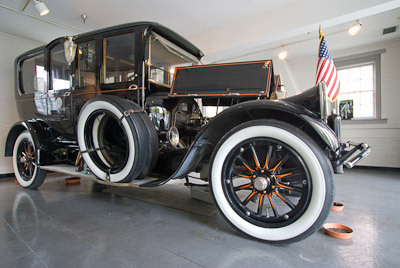 Don’t miss his massive roll-top top desk or the 1919 Pierce Arrow which was used as Wilson’s presidential vehicle. Both are quite impressive. 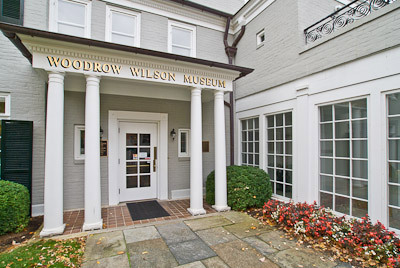 Admission to the museum also includes a tour of the Woodrow Wilson Birthplace, which is located in the same complex. 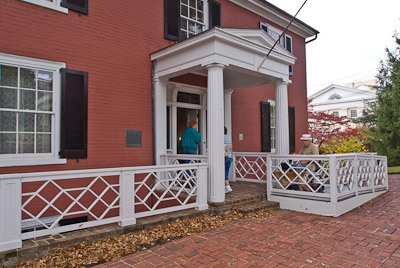 There’s ramped access to the 1846 Greek Revival home, and a threshold ramp at the front entrance. Formerly a Presbyterian Manse, today the home has been painstakingly restored and is filled with period furniture and Wilson family heirlooms. From the melodeon that belonged to the president, to a table set with hand painted porcelain and a sideboard filled with silver, there’s no shortage of family treasures. The tour also visits a few upstairs rooms which are only accessible by a staircase; however a photo album of the rooms is available. And although the are also steps down to the servants quarters, there is an alternate accessible route. Coupled with the Wilson Presidential Museum, a tour of the Woodrow Wilson Birthplace helps bring this bygone time to life. And although it’s not 100% accessible, the majority of the site is very doable for most wheelers and slow walkers. So put it on your itinerary the next time you visit Western Virginia. You won’t be sorry.